MCC has partnered with Ambassador Education Solutions to provide the best value and highest customer service. 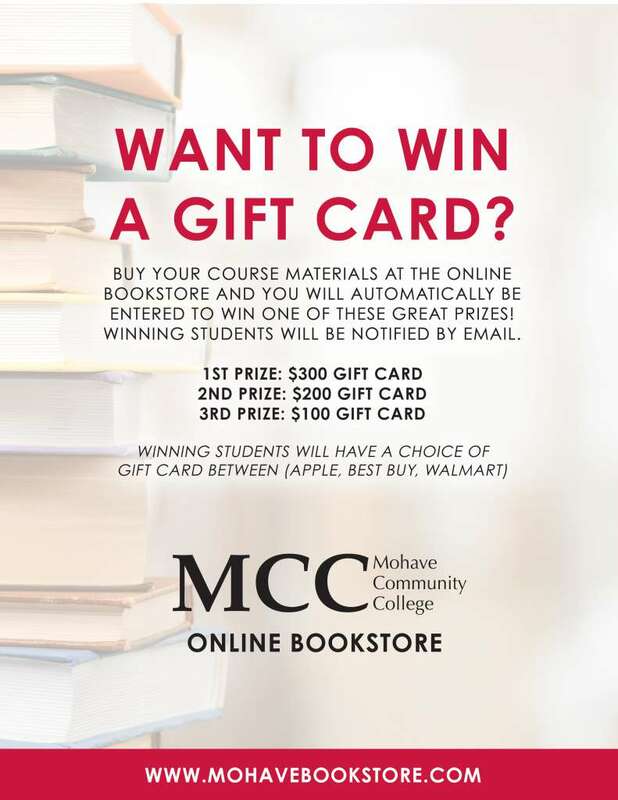 Your Mohave Bookstore is up and running and when you buy your textbooks there, you are automatically entered to win one of three great prizes. Winners will be announced after fall semester begins. Feel free to contact your instructor to verify any additional materials that may be required for the successful completion of the course. The online bookstore will also be your location for MCC branded materials. If you would like to order MCC branded materials now, such as shirts, hats, mugs, etc., please see the local businesses listed on this page because they have the MCC approved branding guidelines. If you know of a business that would like to receive the MCC branding guidelines, please have them email MCC@Mohave.edu. Lastly, please feel free to call MCC Connect at 866.664.2832 if you have any questions after reviewing the information provided. Where Can I Buy MCC Apparel & Gear?